Today I'm sharing five Montessori articles, links and things that you might enjoy! Earlier in the week I put this image on Instagram. The little baskets are new and really help to brighten up the space, I ordered them from Babipur (UK), they look much nicer in real life and are all fair trade! How Sound Blocks Help Babies and Toddlers at Rainy Day Sunny Play, because only this week I put three of our smaller sound blocks on Otto's shelves, they work well as chunky rattles/shakers and he's at the stage where he loves to bang things together. These gorgeous modern routine cards at How to carry out the routines of the home without conflict at Aprendiendo con Montessori, the illustrations are enough to win me over and are by the super talented Marta Abad Blay. Some practical gardening tips - Seeds to Sow with Children and a cute little planting set up at Fred & Ted and Company. This is a gorgeous room tour - Cosima's Montessori Nursery at Our Montessori Way. I hope you have a lovely Easter and long weekend! Montessori at home activities for my 10 year old. I always want to follow my children, to meet their individual needs and wants. At home I've been trying to guide my ten-year-old (Caspar) to try a few new things, not to push but to get him thinking more broadly, thinking outside of the box. Perhaps it's because he has two younger siblings that take up so much of my time but I've been making an effort to spend more time doing things with him, making sure that he is included in some of my daily life and household activities. Here are a few things that we've been doing together or that I've been supporting my 10-year-old to do, that might interest you if you have an older Montessori child. Remember that we are raising tomorrow's leaders, global citizens and stewards of our plant! Think about what qualities and skills we want our children to have that we can support and develop at home. Plan a day out. We have been doing a lot of local sightseeing so I've asked Caspar to research options such opening times, ticket prices, how to book tickets, travel options and to actually book tickets and reserve seats. We've also drawn a map with places of interest around our local nature reserve, to help us better plan our next visit. Re-pot pot plants, plant seedlings. Help to water seedlings. Even better have them plan a kitchen garden or help plan the family's garden plot. Plan, purchase and cook a family meal. It doesn't have to be complex or fancy, just healthy and no ordering in! Or they could make a dessert on the weekend? Perhaps help plan the family's grocery list, weekly shop or list for the farmer's market. We've done this recently with Caspar planning and cooking a family dinner with so much success that Otis (6 years) and Caspar cooked dinner together the following night. Teach the child to make something interesting from scratch. Pancakes, bread, pasta, gnocchi, something they will also love to eat! Reseach family history. This follows one of Caspar's interests which is history. He has a whole folder on his family history and his Pa has been helping and sending him files on specific relatives as they together find out more. Visit the library. This is a core activity in our family! We love our local library because it offers so many books that we wouldn't usually consider reading or ordering. I never force my children to read books they don't like but looking in different sections may help them find an unexplored interest. I often ask Caspar to pick out a new crafting, gardening or cookbook, hoping to spark a new found interest. Write a letter to family who live far away. Some children will love this and others will not be interested. Perhaps post some recent photographs, this might bring some real joy to elderly or distant relatives and only takes a small effort from the child. Clean and reorganise any collections. Perhaps it's time to clean out their collection. Some children start collections but they get neglected, this is a good way to help your child maintain their collection and give it a good old clean out. Plan a fundraiser. One of our friends did this recently and it was so inspiring. Is there a cause that your child is passionate about or that is personal to your family. Perhaps you could brainstorm fundraising ideas, simple things as a morning tea to a collection drive for used clothing or blankets for the local animal shelter, something for us to think about. Organise a clean-up day. We often see litter but don't have time to do anything about it. A clean-up day or morning or just an hour alone or with friends is a great way to teach children to make small contribution to their community without asking for or seeking recognition (remember safety, you may want to use tongs or gloves and have a talk about safety before you start). Research a local exhibit. Ask the child to research and possibly present to the family about a local or visiting exhibit, musical, or production, We've done this with exhibits at our local museum so we all have a better understanding of the topic before visiting. Start or keep a nature journal. Use their own camera, sketches and/or notes to record local and natural observations. Start or keep a gratitude or personal journal. Help sort, organise and donate old toys and clothes. This can help children understand the nature of things and how to manage their own belongings. FInd a new and engaging podcast. There are a few podcasts that are really engaging for children at this age. Play with or teach a younger sibling a strategic game like chess. Teach them to sew on a button or to do small clothing repairs. Offer to take them to new or try out classes such as pottery, yoga or drama. These are just a few of my notes, I'd love to hear your suggestions! Montessori Inspired Age Appropriate Toys 9 to 12 Years at NAMC Montessori Teacher Training Blog. Once your child grows out of the toddler to preschooler stage there really isn't a lot of advice available on how to create Montessori home spaces. When it comes to my children's rooms my aim is to create a space they can be themselves in, that they can grow in, relax in and be at peace in, that they can use to explore the world. It needs to be warm and comfortable. Their rooms also in some way will reflect their individual personalities and interests. Something easy to care for, something to grow. A plant, cactus, carnivorous plant, perhaps something growing from seed. Wall art. Let them choose, I show them an artist or a store I like and let them choose that way, Otis also loves the posters from the National Geographic children's magazine, which would make nice/suitable wall art. Wall calendar. This can include their individual schedule/activities, Otis has a large calendar (similar to this) the back of his room door. A space to display their handmade items or artwork. Not all families like to display items but Otis often likes to put on his wall one or two special pieces. Wall clock. My boys don't have clocks in their rooms but it's worth thinking about. Map of the world or a globe. Reading nook or book corner. Perhaps include some cushions and/or a warm blanket. I love large floor cushions in children's rooms. Area for exploration. Perhaps a bug viewer, magnifying glass or microscope. An area for nature study or nature collection. I don't know a child who doesn't have one of some kind. An area to display found things or to display collections. Collection boxes are nice options. Workspace. Our two older boys have desks in their rooms. Soft lighting. We put on the boys' desk lamps and turn off their main lights after dinner in preparation for bedtime, night lights are useful too. Music centre/player for music, podcasts or guided meditation. Bookshelves or a book basket. Every bedroom needs a few books! Even when we've had larger bookshelves Otis still likes to a have a few carefully selected books in a basket next to his bed. A basket or bag specifically for library books. We've always found it useful to keep library books separate from our own books, it makes them easier to find and to return. Some personal photographs or a small photo album of their own, for photographs they have taken or photographs of themselves with their family and friends. Easy access to personal items. A mirror for dressing (if not available in the bathroom or similar), hooks for backpacks, storage for clothing and dirty laundry, storage for shoes if not stored elsewhere. Art supplies. While you may not want to encourage too many art supplies in the bedroom, a small notepad, pencils or crayons might be a nice idea. Items specific to their areas of interest including toys and materials. We love Schleich Dinosaurs for our Dinosaur lover, a solar system mobile for our child interested in space. Caspar has a couple of Lego technic kits. It really could be anything of interest but make it personal! A space to display trophies or awards. If your child plays a sport it's likely at some stage you'll have awards or trophies that your child might want to display (Otis at six doesn't have any trophies but Caspar at ten years has a lot). If you don't want to display them a special box might be a nice way of keeping them safe. A drawer or space specifically for electronics and rechargers. A dedicated drawer helps to keep these items safe, tidy and in one space when not being used. These suggestions aren't limited to Montessori home spaces but provide some ideas on what we consider. It's easy to say and hard to do, but we try for a less is more approach. There is no need to overfill their rooms. We can feel overwhelmed and unable to care for our things when we have too much! The room doesn't need to be fully decorated, the bookshelf doesn't have to be full, allow some space for the child to grow into the room. And as always, follow the child! Five tips for creating a Montessori inspired bedroom. Montessori Home Environments for a Five-Year-Old. Caspar's Room (this is at 4 years). Ways to Respect the Baby - because we could all do with a reminder! Individual developmental needs - don't rush, push or force. Observe and follow the child's lead, provide an environment that is developmentally appropriate. Need for sleep, rest and play (active time) - strive for rhythm not forcing a schedule or routine, learn to read and follow cues. Need for comfort, warmth and, security - respond to cues when given (no CIO), be attentive, allow the child to build trust in their environment and in those around them. Need for movement - provide time for free movement don't over-use devices that restrict movement and totally avoid those without purpose or need (like jumpers or similar baby walkers), provide a safe comfortable and warm movement area, provide clothing that doesn't restrict movement. Need for concentration - try not to break the child's concentration, provide an environment generally free from artificial distractions like television, provide uninterrupted free time. Need for gentle and considered tone and touch - we may be rushing, picking older children up from school or in the line at the supermarket, as much as possible use a well-considered tone and touch to the baby. Voice and touch are important ways we communicate with the child, voice (especially that of the mother's) can be particularly soothing to the very young child. Need for a strong ego, need for trust and a positive relationship with the environment - allow the child to be a participant and a collaborator with care activities such as washing, changing and dressing - ask for permission and wait for a response, inform the baby what is going on, what is going to happen next, do things "with the child", not "to the child". Need for integration and personalization (the child being in touch with body and mind) - this can be particularly relevant to feeding, respect the child's need to self-feed, even on the breast allow them to detach when fully satisfied (when/if possible), don't overfeed or force feed (unless medically advised), follow the child's cues. Try not to placate the infant with food or pacifiers - I find in reality there are some genuine exceptions especially in stressful circumstances but we can acknowledge this is not ideal. It's important to remember that you, the parent or caregiver have needs too! I hope you find this reminder useful. How was your week? Otto has been teething, so there hasn't been a lot of sleep going on around here. On a positive note, it's now Spring and the school holidays start next week! Here are a few articles that I've been enjoying. If you have a toddler you must read this - and take look at the gorgeous pictures. The Development of the Will: Movement in the 0-3 Year Old Child at Villa di Maria Montessori School. Montessori Basics: What is the Montessori work period? at Bergamo Montessori School. If you are a teacher you might enjoy this, A Day at a Montessori School in Seville at Pequefelicidad. There is a lot to love in this home. Our Montessori Home Through Pictures at My Little Keepers. If you have a toddler you might also like some of their activity ideas. Nature Exploration: what you need to take with you (the best ideas from our Forest Playgroup) at Mothers Abroad. Otis has been attending Forest School once a week and next term Caspar will start too. I can't wait to see what Forest School looks like for a 10-year-old (he is Year 5). A sugar-free, children's recipe to try, In the Kitchen - Almond Bread at Our Montesstory. "I know happiness does not come with things. It can come from work and pride in what you do." - a fantastic Gandhi quote at Micheal Olaf. You may know that I've been looking for realistic story/picture books about squirrels, something suitable for young babies and toddlers, Amanda left a comment suggesting Squirrels Leap, Squirrels Sleep, and it is the best! It is illustrated by Steven Jenkins, the rhyme is perfect and it captures the mischievous nature of the squirrels very well! I've included some pictures of Otis' most recent baking adventures just to remind you that baking with children gets easier (he is six and can do all of this independently) but there is still some letting go involved, it's not perfect! (He has a mini bakers subscription, these are hot cross cupcakes for Easter). It's now Spring, although it still feels like Winter and we have a tendency to want to rug our babies up and keep them inside. At six months the baby is grabbing and pulling and putting things in their mouths, we are constantly saying no and keeping them away from everything precious. But at six months the child is capable and interested and has an innate desire to explore. Today we spent some time in the garden, just watching the birds and squirrels play around us. The change from Winter to Spring is magical, last weekend these Daffodils were covered in snow. The child can not only see this change, they can experience it and touch it. In the garden, there is a calmness and so many things to touch, explore and observe. The fresh air is so good. The six-month-old hands are also learning to grasp, to pick up small objects, we use organic grain puffs or even bread pieces to keep the hands busy while waiting for lunch. This is a fantastic way to encourage fine motor skills in a safe and every day way. The hands can grasp a weaning glass but need help to tip it up. The weaning glass tells the child we trust them and yes, you can feed yourself. Rattles, board books and, other manipulatives help to create an environment of yes. Otto is my most oral child yet and we are carefully guiding him not to eat or chew his books. They are so little but their hands can do so much! Otis (six years) loves being in the kitchen. He loves making and baking. He loves his kitchen gadgets and appliances almost as much as I do! The boys have school holidays next week so I'm already thinking about what food and snacks we'll need. It has me thinking about the children's favourite kitchen appliances. It should be noted that not all of these appliances are made for or targeted at children. Also as a Montessori family, we may introduce some of these appliances at a younger age than other families. Mostly Otis will use them independently but always under close supervision. What are his current top three kitchen appliances? Hot Chocolate Maker (US here). Small Skillet/Fry Pan - Otis has used this to cook independently since he was around three years and it is still used weekly, easy to use on low heat. Toaster Oven - he uses this to bake independently on most weeks since he was around four, usually, things like cakes or muffins, or even pizza, programmed settings make it easy to use. Toastie Maker/Sandwich Press - he loves cheese toasties on a cold day. The advantage of some of these appliances is that they can be plugged in and used at the child's height, on a low table or work surface. It's often safer than having them use the larger cooktop or oven. The advantage of the popcorn maker or donut maker is that they are contained, there is no oil or frying involved. I also love the novelty factor, I am sure Otis would also love an electric pie maker, waffle maker or ice cream maker if we had one! The independence factor is a big one, allowing the child to use an electrical appliance involves skill building and trust. It also allows them to do real work, contribute to the family or perhaps provide a snack or treat for themselves or a friend. A Montessori toddler teacher once showed me an electric orange juicer she used in her class, being electric the children loved using it and they were able to make enough juice to share, rather than juicing by hand where they will tire easily (similar style here, the child still juices from the top). I've provided links to the appliances that we have, however, we often use international power connectors, something to keep in mind if you order from overseas. I'd love to know your children's top three or most used kitchen appliances or what appliances you use in your classroom! If you have younger children or are not ready for kitchen appliances, but still want ideas for the kitchen, you might like my previous article A List of Kitchen Tools for Children 1 to 4 Years. An idea for the school holidays - Design your own tee with My Monster. Today I'm sharing a fantastic idea for creative kids, perhaps as a gift or as an activity for the school holidays! Out of all of my children, Otis (six years) enjoyed this the most! I also have a discount code for you at the end of the post. All tees and products shown are c/o My Monster. The idea here is simple, in the kit you receive a tee or jumper (colour and size of your choosing) and a set of Monster stickers - bodies, eyes, mouths, arms, legs, and, accessories. The child arranges the stickers on the tee (or jumper) in any way they like. There are lot of stickers to choose from and the child can take as long or as little time as they like to ensure the Monster is just the way they like it. Then with adult help, they peel the back of the sticker off, stick it in place and iron it on. We found it really easy to do. I did most of the ironing as I wanted to be careful - you press down with the iron not move it around. Once the sticker is ironed on the plastic backing just peels off the tee. The colours are vibrant and the Monsters are crazy!! The child can be super proud of their efforts. Perhaps it can get their creative juices going and they can think of other ways to use the left over stickers or other ways they can customise their clothing? My Monster is offering a 15% discount to HWM readers with the discount code Monster15 at checkout. Thank you to My Monster for our tees and for sharing your product with us. You can also follow My Monster on Instagram! Notes to a Montessori Parent - Follow your child, and why comparing children isn't helpful. I remember when Otis was four, there was a young boy in his class learning long division. Wow, just wow! Every time I saw the boy I tried to take a peek over his shoulder to see what he was working on. The accomplishments of this young boy should be celebrated, just as the accomplishments of the other children in the class. His achievements do not lessen the achievements of the other children. It doesn't always work like that though does it? I remember being a first-time parent going to our Mother's Group. All of the other babies sat, waved, clapped, crawled, and walked before Caspar. At one birthday party, all of the other children were walking around, except for my child who just sat there. I felt so insecure like I was doing something wrong, thinking that my child was a slow learner, that perhaps we hadn't done enough to support him at home. We all want the best for our children but over time I've learnt that comparing our children is not helpful, it can be potentially harmful, we need to respect each child for where they are at and to meet them right there. Now I am becoming more active with Otto (six months old) I see the comparisons coming thick and fast. It's natural to make small talk with strangers, aquaintances, other parents and even to discuss these things with friends. "How old is your baby?" "Are they rolling/crawling/sitting/walking yet?". Or to see other children online and to think "should my child be doing that too?". The answer is no, no, no. Just because another child is ready to use the moveable alphabet, use scissors or to start using the potty, does not mean that your child is ready to and it could be harmful to them if you think like this. We need to respect the child's individual timeline, respect the child's individual developmental needs. Every child learns at their own pace. Remember that your child is not you and that siblings may be very different too. Just because one child was reading at three the next may not be, and that is ok.
Don't rush the child, they will do it when they are ready and not before. Rushing or forcing it isn't helpful. We need to have realistic expectations. Unrealistic expectations put pressure on yourself (the parent) and the child and will often lead to frustration and disappointment. Try to live in the moment, appreciate where your child is at right now. We can look ahead to the next step, the next milestone to prepare the environment, have materials and knowledge ready but wait until the right time to present it. Be aware of age recommendations, they are important but are a guide only, just because the egg and cup are recommended from six months, your child may not be ready for it until they are nine or ten months. By presenting materials the child is not ready for we are not only not meeting their current developmental needs, we are sending them a harmful message that you are not good enough and we need or expect more from you. Celebrate milestones and achievements of your child and that of children around you. Children and parents are often proud of their achievements such as when the child first walks or reads their first chapter book. Distance yourself from or keep your thoughts in check if you have particularly competitive friends, there are some people who can make parenting feel like a competition, this isn't helpful or healthy. Articles on this site are categorized by my children's ages, however, this is to keep them in some type of order and context, the aim is to be helpful as a guide not as a benchmark, even children within the same family develop at different rates. I love to talk to other parents about childhood development however it is important to get professional advice if you are concerned about your child's development or developmental delays. Give me some colour!! Don't take yourself too seriously - Children's Tables and Chairs. When we arrived here a couple of months ago I ordered this cute and colourful table and chair for Otto. It is toddler sized, I was thinking of shortening the legs but now I'm not sure, the chair is low and the seat is wide which is great for toddlers. I needed some colour in my life, some colour in our spaces. I might go over the top with colour at times but I like my home spaces to feel fun, lighthearted, fresh and spontaneous. On the internet and when talk about Montessori in general, we can all get a bit serious and for just one day, for just one blog post, it doesn't need to be like that. Today I'm daydreaming of bright, light-filled rooms with tasteful, colourful furnishings. Children's furniture doesn't need to be bold or brash, some of these colours would work for adult furniture too. Lacking colour in your children's spaces? I've also used a dash of paint on spare chairs to colour things up a little (last picture here). Of course, colourful artwork and/or other transient furnishings can help too. I know there is a whole lot of information about colour theory and how colour can affect our moods but it can also make a space personal, individual and you! Where to find Montessori Infant Materials - around the world. It's always difficult to find the Montessori materials you are looking for in a store near you. So many Montessori infant materials are handmade, finding them is often dependant on finding an Assistant to Infancy trained guide near you. Many materials can be DIYed so if you are interested, have a search or let me know, I might be able to find a tutorial for you. In a lot of locations, Etsy is a good place to start. As always, do your research and know what you are looking for, not all times listed as 'Montessori' are recommended or fit within the philosophy. If you are unsure about a piece of material, contact the store first and ask some questions, hopefully, you will get someone trained in Montessori who can offer some advice. I know a lot of store owners and they are fabulous people who are very generous with their time and Montessori knowledge! A lot of these stores stock Montessori materials for toddlers and older children too. I Am Montessori* - Imbucare Boxes, Stacking Materials, some Puzzles. The Kid Specialist* - Interlocking Discs, Rattles, Stacking Materials. Montessori Australia* - Imbucare Boxes, Infant Bell Rattle, Interlocking Discs, Teething Ball, some Rattles, Egg and Cup, Simple Shape Puzzles, (Neinhaus/school quality). A2Z Montessori - Imbucare Boes, Interlocking Discs, Egg and Cup, some Rattles (not everything listed would be recommended Montessori material). Think Education - Cube Chair, Teething Ball (this store is generally for schools). Montessori Child - very few infant materials, some Rattles, (worth browsing as stock may vary). 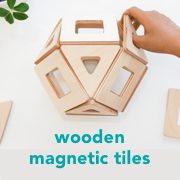 Montessori Shop* - Imbucare Boxes, Interlocking Discs, Puzzles, Stacking Materials (if you are in Australia this might be a good option too). PinkHouse Handworks* - Crochet Rattles, Egg and Cup, Interlocking Discs. Essential Montessori - Mobiles, Rattles, Interlocking Discs, Egg and Cup, Ball and Bell Cylinders. Handmade Montessori* - Some Mobiles, Placemat. HeirLoomKidsUSA - Bell and Ball Cylinders, Palmar and Pincer Blocks, Simple Puzzles, Interlocking Discs Stacking Materials and more. TopponcinonMore* - Topponcinos, Gobbi Mobiles, Grasping Beads. BabyBurrows* - Topponcinos, Butterfly Mobile. Michael Olaf* - Topponcino, Grasping Materials, Weaning Table, some Mobiles, Placemats. Alison's Montessori - Some Rattles, Imbucare Boxes, Stacking Materials, Simple Puzzles. For Small Hands - Some Rattles and Grasping Materials, Suitable Board Books. Skyflight Mobiles* - Whale, Butterfly, and Bird Mobiles. Beginning Montessori* - Stacking Material, Egg and Cup, Interlocking Discs, Bell and Ball Cylinders. E&O Montessori - Imbucare Boxes, Simple Puzzles, Stacking Materials. Manine Montessori* - Rattles, Puzzle Ball, Montessori Mobiles, Interlocking Discs, Bell and Ball Cylinders, Palmar and Pincer Grasp Blocks and more. Bunny and Bella - Mobiles, Interlockings Discs, some Rattles. Absorbent Minds* - Rattles, Sorting Materials, Simple Puzzles, Stacking Materials, Imbucare Boxes (includes some Nienhuis, great for ideas even when browsing). Montessori Design by Nuccia - Egg and Cup, Stacking Materials, Imbucare Boxes, Simple Puzzles, Infant Bell, Interlockings Discs, Montessori Placemats (lots of Nienhuis). LESekShop* - Weaning Table (to Montessori specifications). MimiaMontessori* - Placemats, Puzzle Ball. KIDOBO - Imbucare Boxes, Stacking and Threading Materials, Ring Return, Simple Puzzles, Interlocking Discs (in the Ukraine). Pruefl - Imbucare Boxes, Bell Rattle, Egg and Cup, Interlocking Discs and more (in Germany, lots of Nienhuis). 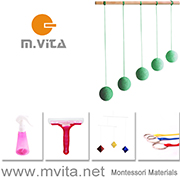 M.Vita* - Mobiles, Interlocking Discs, Puzzle Ball (if you are in Australia this might be a good option). A Little Montessori - this account is private but you may want to make contact if you are in the Philippines. If you have any specific questions, please feel free to ask. While living in the UK I've ordered from many stores throughout Europe and I've never had a problem, so far shipping from around the EU has only been a few days to a week, in some cases my orders have arrived in two days and within the EU there is no customs tax. While living in Australia I have ordered from Canada, USA and New Zealand, delivery costs can vary and placing a large order with friends can help. Shipping from the US is often 3-4 weeks. This is not an exhaustive list, there are a few materials, a few bits and pieces you can find elsewhere and of course, there may be stores that I don't know about, it's very hard for me to research non-English speaking stores. There are also many, many toy stores, school supply stores and other variety stores that stock materials suitable for a Montessori home. Providing comfort and security to the newborn. Where can I find a Montessori Topponcino? Where can I find a Montessori floor bed? Montessori at Home in the UK - resources, blogs, books and things. Beautiful Montessori Rattles on Etsy. * = stores that I have personally ordered from. If you would like to add your store to this list please send me a message. Today I'm sharing some Montessori home spaces that have touched me in some way. Some are beautiful and inspiring while other remind me of the importance of organisation and order. Above is just one image from the Montessori365 account which is calming and simple - never overwhelming. A child's organised kitchen space at Family Friendly Home. A gorgeous kitchen space at The Curious Craft. In all areas of our homes, we can only work with what we have, just a little cupboard or a few drawers may be all the child needs. A well labeled and organised space at No Milk Today. My children's drawers never look this tidy, the labels and dividers would help a lot. This is from Ghia's account, she is a mum to two. This is a good example of incorporating a little space for the child into the home environment. This space is for a seven-month-old child, I love her selection of materials too. This space - because beauty means different things to different people and I think this space is stunning and inspiring. A child-centered, nature-filled, beautiful space - what could be more Montessori? Also, this space because I absolutely love the print! Finally, this space because it looks super comfortable for the young child! I hope you've enjoyed these Montessori spaces as much as I have. This post uses images embedded from Instagram, if you are reading this in an email or RSS feed you may need to click over to here to read the full blog post. When do you allow your child to walk to school by themselves? Is this the right time for him? When do you allow your child to walk to school by themselves? If you have free-range children you may have them start earlier than others, however, it's not always your decision alone. Often when deciding when a child can walk to school by themselves the school needs to be involved too. This is a situation where we can say "it depends". It depends on the child, the distance, the school. However, I have found that in my community there is a general consensus that for many children it is around Year Five or when the child is 10-11 years old. I recently spoke to the head of our school specifically about children walking to school independently. He mentioned that typically this starts in Year Five, is initiated by the parent or the child, but he has experienced two occasions where a member of the public has taken it upon themselves to walk a child to school because they didn't feel it was safe or appropriate for the child to be out walking alone. The child lived two blocks away, much closer than we do and the child was the same age as my son Caspar. Our school is supportive of children in this age range walking to school and their procedure is that if they or any student isn't at school or reported sick/absent by 9am, the parents are telephoned. Excellent, this is what I wanted to know, if for some reason my child doesn't make it to school, I will be called. Ensure the child has one clear route they are to follow. Practice the route and be aware of any tricky parts like crossing roads, make the most of pedestrian crossings. Be organised so the child has all their belongings together and feels calm not rushed before leaving the house. Ensure the child is dressed appropriately. I don't want a cold or wet child. Our school has a rain jacket, beanie, wool gloves, and a base layer as part of their uniform so the kids need to remember to wear them, or put a rain jacket in their bag, there's no such thing as bad weather! Ensure the child knows what time they need to leave the house and/or hit certain landmarks to reach school in time. Have rules such as no catching lifts or going to friends houses. We allow Caspar to stop in at the bakery but unless he has previously asked he isn't to go into any other shops. We don't yet allow Caspar (10 yrs) to walk to school alone. He currently walks to school but blocks ahead of Otis, Otto and myself. If he was unsure about something, or someone, or was worried or hurt himself he could just wait and we would catch up, or he could turn around and walk back to us. Caspar has an earlier start time than Otis and to be honest when they walk together they fight, so this really works for us. Even if we continue walking this way, after all, we all need to get to school, there are so many benefits. It doesn't suit every family or every family circumstance but it has allowed us not only physical health benefits but the benefit of becoming familiar with our new community. We walk through our village centre and we often see the same people every day and each time we build on the friendship, we make a connection, even if it's just a 'good morning' or 'how is the baby today?'. It's this everydayness that makes it special. We also learn about our neighborhood, the wildlife, and the seasons. Let me know if you have any tips or if you have been through this process. Unaccompanied minor at YouGov UK. When Are Children Ready to Walk Alone? at the Huffington Post. This is my second post in a monthly series on children's clothing. Clothing that we love, clothing that is fun, practical and true to our Montessori values! Clothing is so important for children and more so for infants. Otto (six months) spends most of his day on the floor on a movement mat or on a play mat at friends or curled up in his brothers' arms. Having soft, comfortable clothing that keeps him warm and allows him to move is a priority. Previously Otto was wearing soft woolen booties when we went out visiting or at home, just for warmth. Now he is learning... trying so hard to crawl, he needs something that will grip the floor better. When Otis was little he wore the very similar, cute, red Nowali shoes. I still have them but needed a smaller size for Otto. So I looked around and decided to try Moccis. These little croc designs are so cute and they fit so well, it was love at first sight. We try for Otto to have bare feet as much as possible, however, he stills wears his Moccis every day and now I'm not sure what we would do without them. We ordered our Moccis direct from the Moccis website (they offer international shipping) however this same style is available on Amazon UK, and they can be found in some specialist stores in Australia and the US. What we are reading - a few new books. March 2018. Today I'm sharing some of the books we've been enjoying recently! When I search for Montessori baby books, the same titles keep on coming up. It could be because these are the tried and true and it could be because we aren't reviewing new baby books. Books like Priddy's First 100 Words will never go out of fashion in Montessori homes - the clear realistic images on plain backgrounds, of every day objects, is just perfect. The whole Priddy series is fantastic. Another series that I love for babies is the DK Baby Touch and Feel Books. Again it's the clear images on the plain background that I appreciate. Also, many of these focus on every day objects or common animals. Otto has just turned six months old so he is past a lot of the black and white baby books. I need to emphasize that Otto listens to a lot of his brothers' books, he listens to Otis read his school readers every night and most nights he listens to me read a bedtime book to Otis. It's great for babies to be exposed to a wide range of language. Most often Otto only has three books in his book basket but will also have a single book on his low shelves in his room or in the living area and will often have a book or two next to my bed or even next to his brothers' beds. What books are we currently reading with Otto? Touch and Feel Baby Animals - this is Otto's favourite! Kew: Lift and Look Flowers and Plants - this is a gorgeous new release! My First Body - I can see this being a hit with toddlers. For Otto, reading time isn't really about the books, it's about language, it's about sitting together, holding, the stillness, the comfort, it's the sweet little gurgling noises he makes as he tries to copy our words. Otto and I love watching the playful squirrels in our yard, please let me know about any realistic, lifelike board books about squirrels suitable for babies or early toddlers. Otis is very busy reading school readers every night. He has a little notebook that has written in it what book he is reading, what page he is up to and any words he needs help with. Every night I read the comments and write in the book which gets passed back to his teacher. This little book is an invaluable communication tool and I wish we had used something similar at our previous schools. Previously I was told what words or sounds he was learning only if I asked, so follow up at home was difficult. His reading has never progressed so fast and his confidence is at an all-time high. This reading at home is not compulsory but naturally, most parents do it most, if not all nights, and is the only homework asked of or given to his Year Two class. Otis also loves to read to his younger brother. One of his new books that we are all absolutely loving is The Little Book of Night-Time Animal Sounds because the sounds are SO lifelike, they must be real recordings, the facts are new to us and interesting and the boys get so much enjoyment from it. I had always wondered what a Badger sounds like! I'm not driving very much here as we walk to school and I am not listening to the same volume of audio books that I had been in Brisbane. I love The Montessori Toddler, it is comprehensive without being overwhelming, it can be read from front to back or you can just pick it up midway through and get some fresh ideas. If you have read it and/or want some additional support in creating a Montessori home, Simone, the author of The Montessori Toddler is starting one of her e-courses this Monday 12th March but registrations close Sunday! Simone is a leader in this industry because she communicates with parents so clearly. I have done this course and highly recommend it, even if you have an infant now, it's worth thinking about for the future. With the snow storm we experienced last week I have been revisiting many of the concepts in my 2017 favourite There's No Such Thing As Bad Weather. Another book that is worth sharing is A Life Less Throwaway. It has actually changed my purchasing habits and thought processes, it's about buying less but better quality and it contains practical advice on how to shop (including brands) but also how to maintain and look after the things you have - I love that! It's actually changed the way that I wash my clothes too! Please feel free to share any good books in the comments. It's Friday night here and I've already done the grocery shopping for the weekend and caught up on the laundry! I hope you have a lovely weekend!